Recently, I decided to install Age of Empires on my computers. The game came up in a conversation with someone who periodically hosts AOE parties. Anyway, it was one of the few PC games I played growing up, and also one that my wife used to play. When I got home, I discovered that, indeed, I did still have the original discs for Age of Empires, the Age of Kings Expansion, and Age of Emprires II. I believe my sister salvaged them for me from the boxes left when my parents moved from a house to an apartment. In any case, I had the software that I needed, so I installed it on my wife's PC running Windows XP. That done, I had a couple of old PCs running Windows 2000, but those are on the same KVM with my wife's PC, so they couldn't be used for multi-player. The problem was Windows 7. I had heard that it wouldn't be pretty (you have to shut down Explorer to play), so I decided to virtualize. That way, I wouldn't need to give up any part of Windows 7, even Aero, and it would run seamlessly. I had used VMWare before, so that's what I started with. VMWare Player is free to download, and so I did. The installation went pretty smoothly. 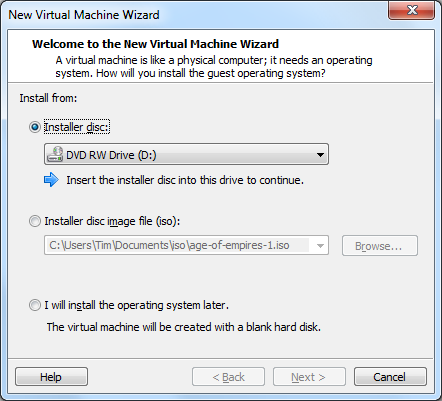 I chose to install the option to install the OS using the VMWare wizard, which turned out to be a problem later on when I had to manually eject the virtual floppy drive in order to be able to install VMWare Tools (VMWare thought that the OS installation wasn't complete, when it was.) 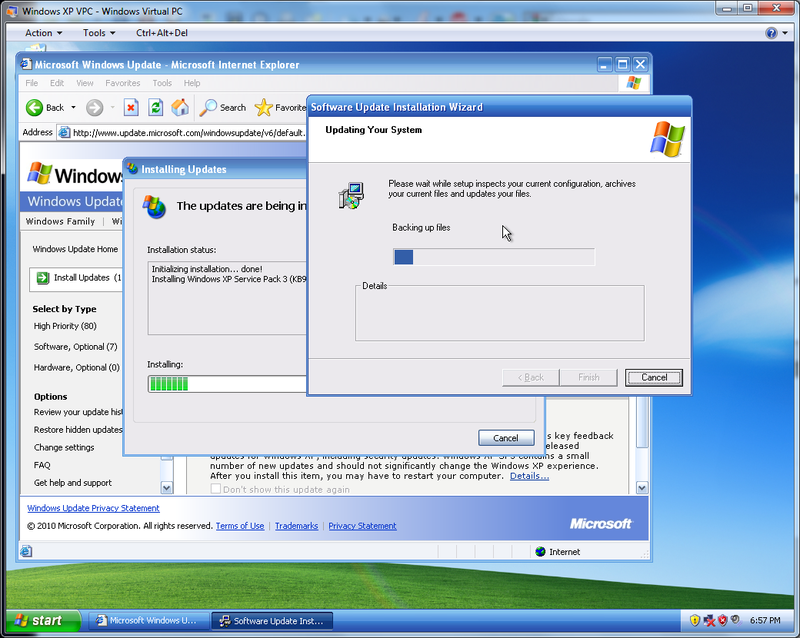 Next time, I'll choose the option to install the OS after creating a blank virtual machine. After installing the OS (I used the original XP that came with my laptop), I updated to SP3, and then had Windows Update install all of the latest patches. 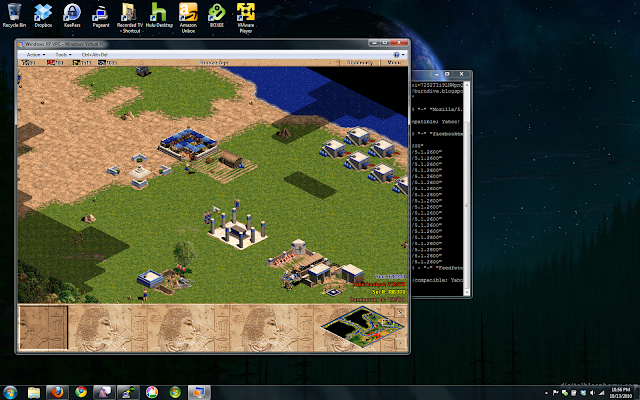 Once everything was updated, I installed the Age of Empires games and applied the appropriate patches. 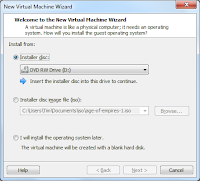 I also created a small subset in my list of software suitable for a minimalist virtual machine. After that, I was good to go, so my wife and I fired up the game and played a few matches. We had to brush up on our skills first, but it didn't take us long to get back into the swing of things. I used Bridged mode for networking, but even so, I had to disable Windows Firewall on the XP VM in order to host an AOE game, even after creating a firewall exception, and expanding it to the whole subnet. Of course, it wasn't perfect. Even though I had VMWare Tools installed, the mouse was a bit unresponsive, and VMWare Player tends to release the mouse if you cross the edge of the screen. For this reason, and because I also wanted to try another option for virtualization that I hadn't used before, I decided to also try out Virtual PC. It took some doing to find the download link for the latest version of Virtual PC. I think that Microsoft doesn't want anyone running Windows 7 Home Premium (which is what I have on my laptop) to find the file. I kept being redirected to Microsoft Virtual PC 2007, which is the appropriate version if your host operating system is Windows XP or Vista, or to upgrade to Windows 7 Professional or Ultimate. 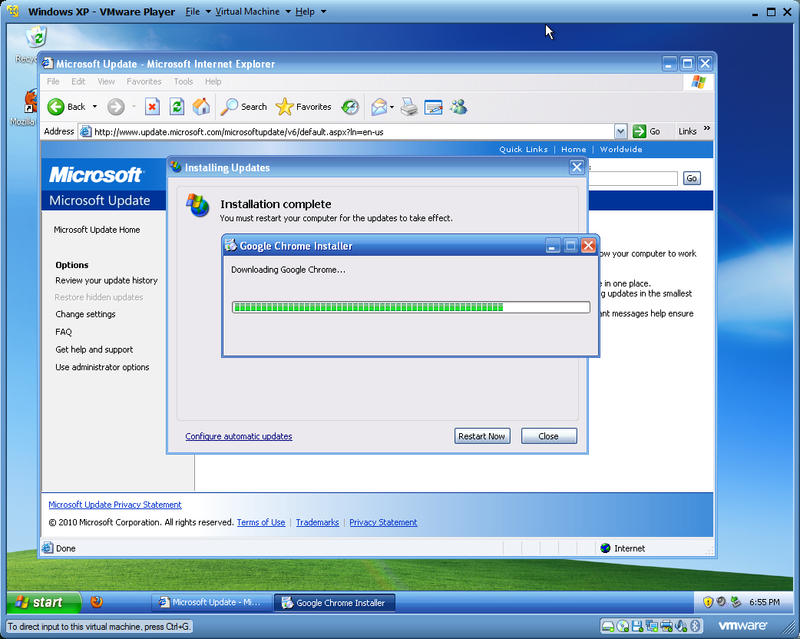 I finally found the right link for Windows Virtual PC, which only supports Windows 7 as a host OS. This is also the basis of Windows 7's Windows XP Mode. Indeed, when I installed Windows Virtual PC on my Windows 7 Home Premium, it created a link in the Start Menu for Windows XP Mode. The link doesn't work (it only displays a message that it won't work in this edition of Windows), and the only other item in the Windows Virtual PC start menu folder opens a folder. At first, I couldn't figure out how to create a virtual machine in this folder, but then I noticed the bar at the top of the folder window. When I created a new virtual machine, it stored only a small data file in that folder, with the virtual disk files buried out of sight in my hidden AppData folder. This approach is different from that of VMWare, and it reflects the fact that Microsoft does not expect me to move this VM, back it up, or access its underlying files. 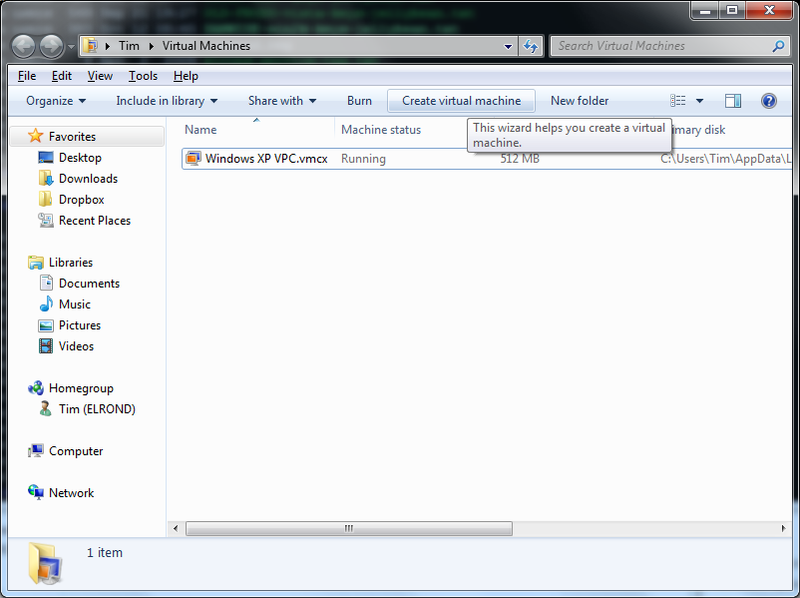 It's supposed to "just work", and I'm supposed to treat this small VMCX file as a proxy for the whole VM. With VMWare, I can easily move or back up the VM by moving or copying the folder containing all of its files: to a different drive, or even a different machine. 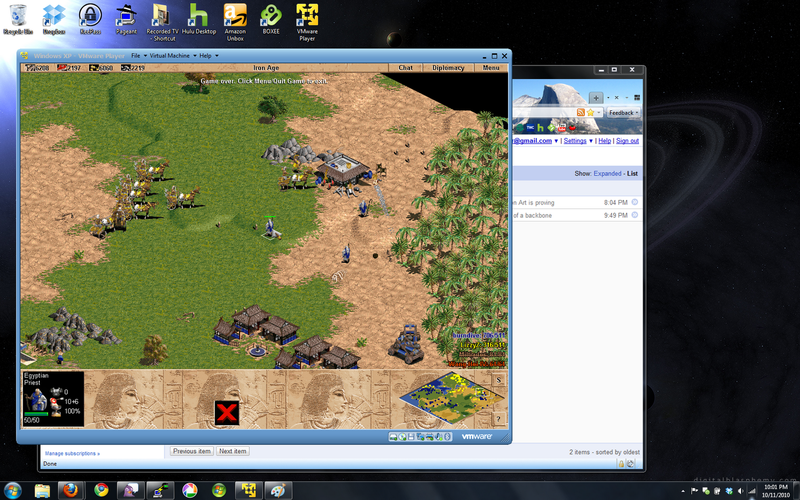 Windows Virtual PC with the Integration Tools installed has almost perfect mouse movement, which is essential for playing a real-time strategy game such as AOE. It wasn't difficult to get used to hitting Ctrl+Alt+Left to escape input capture, instead of VMWare's Ctrl+Alt. 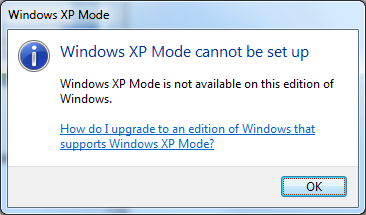 I do have a license for Windows 7 Ultimate, so I would like to check out Windows XP Mode. However, this license is currently installed on our living room media PC. It will take a few hours to set up, so it will probably have to be a free afternoon on a weekend. If I installed the key currently on my laptop on the media PC, I might be able to use "Anytime Upgrade" to install the newly-unused Ultimate key to my laptop without doing a re-install. We'll see. Try the same with Age of Empires III and play in ESO!